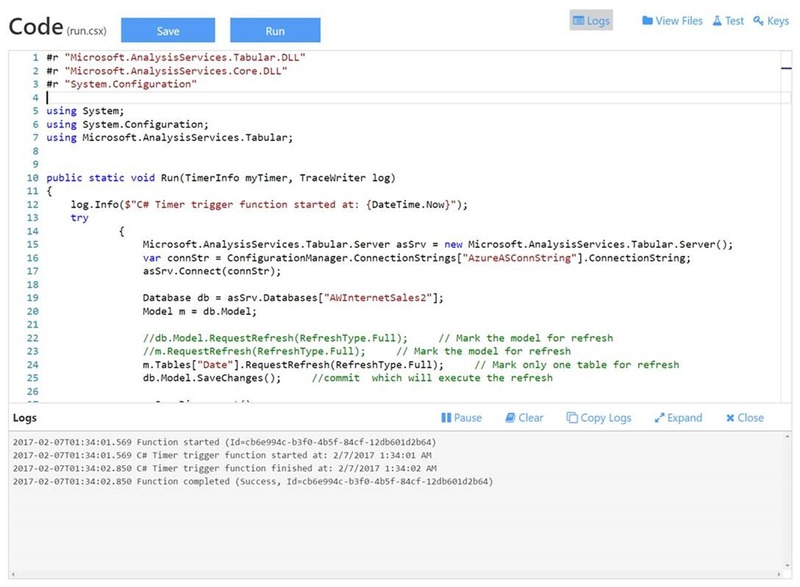 In this post, we’ll walk through a simple example on how you can setup Azure Functions to process Azure Analysis Services tables. 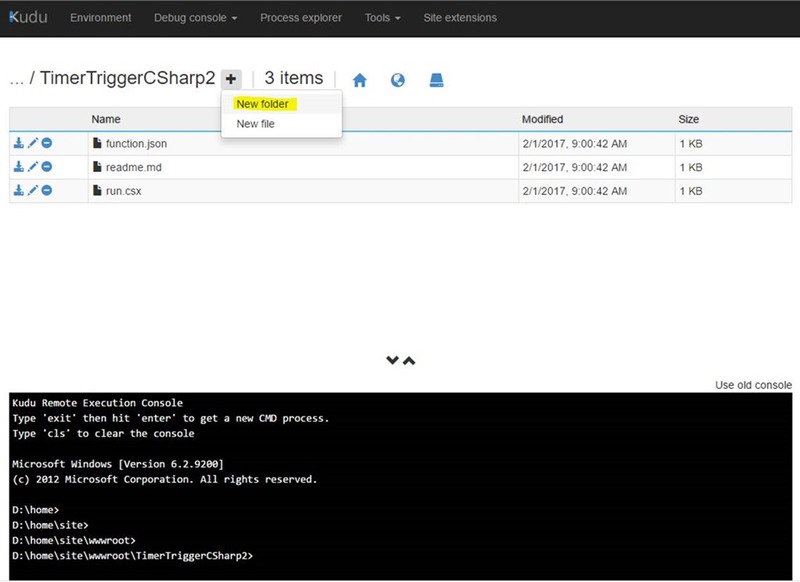 Azure functions are perfect for running small pieces of code in the cloud. 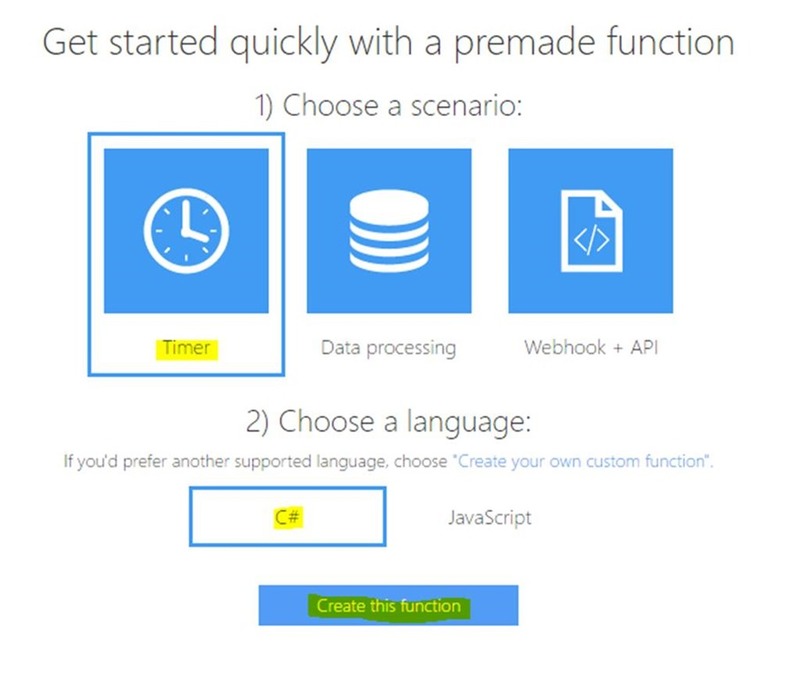 To learn more about Azure Functions, see Azure Functions Overview and Azure Functions pricing. 1. Go to the portal and create a new Function App. 2. Type a unique Name for your new function app, choose the Resource Group and Location. For the Hosting plan use App Service Plan. Note: As the duration of processing Analysis Services tables and models may vary, use a Basic or Standard App Service Plan and make sure that the Always On setting is turned on, otherwise the Function may time out if the processing takes longer. Click Create to deploy the Function App. 3. In the Quickstart tab, click Timer and C#, and then click Create this function. Now that we’ve created our new function, we need to configure some settings. First, let’s configure a schedule. 1. Go to the Integrate > Timer > Schedule. The default schedule has a CRON expression for every 5 minutes. Change this to any setting you would like. In the example below I used an expression to trigger the function at 3AM every day. Click Documentation to see a description and some examples for CRON expressions. Before we begin writing our code, we need to configure the application. Important: Make sure you have the latest data providers installed on your computers. 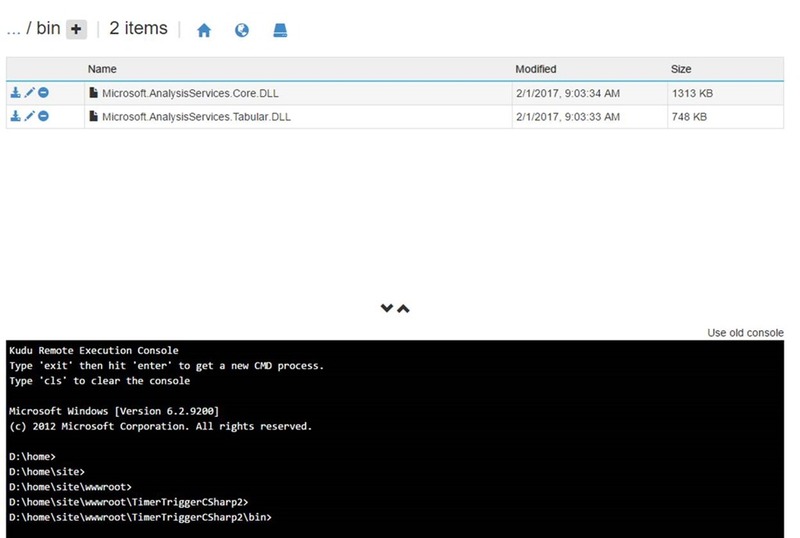 To get more info and download, see Data providers for connecting to Azure Analysis Services. 1. 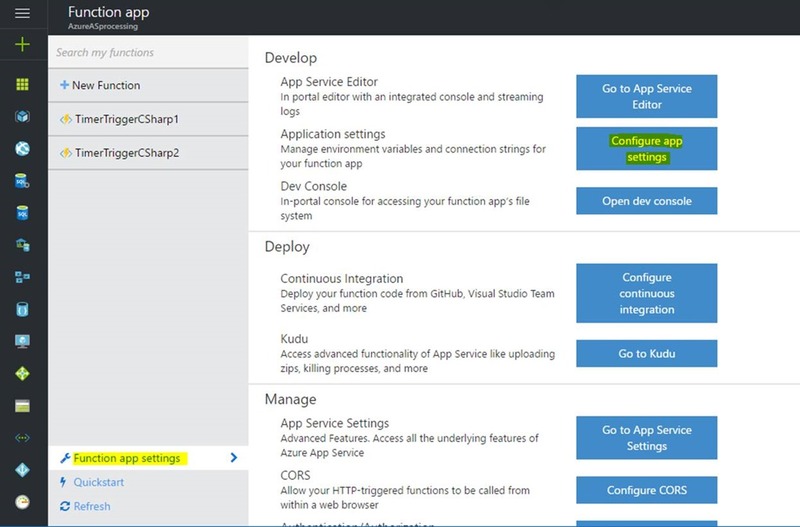 In the new Azure Function, go to Function app settings > Go to Kudu, to open the debug console. 2. Navigate to the function in D:\home\site\wwwroot\yourfunctionname, and then create a folder named bin. 4. Refresh your browser. In Develop > bin, you should see the two files in it (If you don’t see the file structure, click View files). 5. Before we write our code, we need to create a connection string. 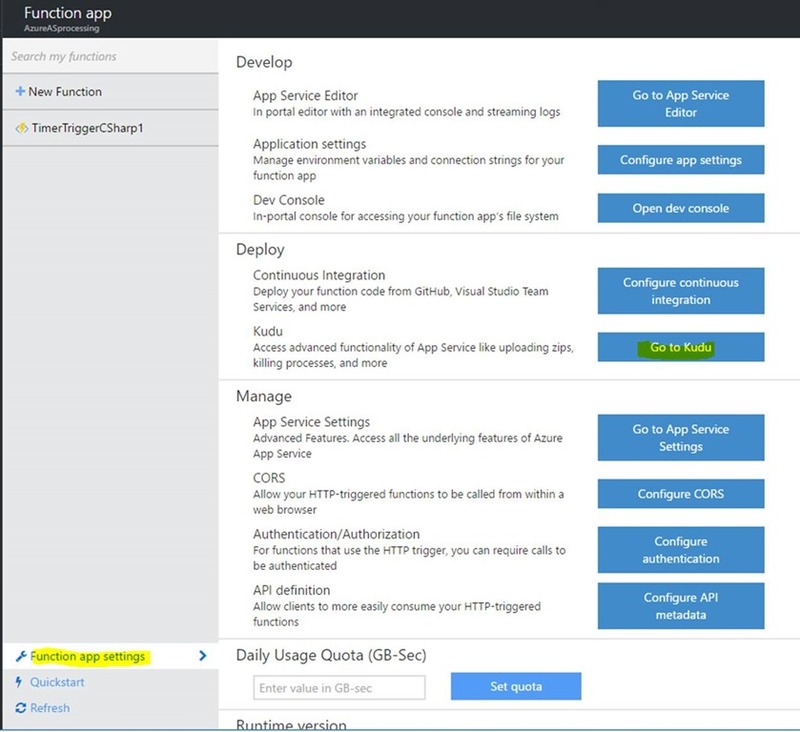 In Function app settings, click Configure app settings. 6. Scroll to the end of the Application settings view, to the Connection strings section, and then create a Custom connection string. 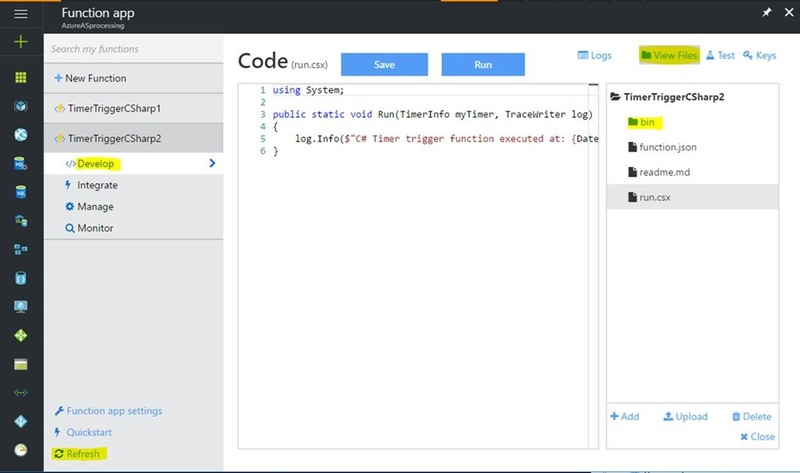 Now that we have our function’s configuration settings in-place, we can enter the code. You’ll need to reference the DLLs we uploaded, but other than that it looks like any other .Net code. Note: In this example, I included some commented lines to only process a table or the model. Click Save to save the changes, and then click Run to test the code. You’ll get an output window where you will be able to see the log information and exceptions. 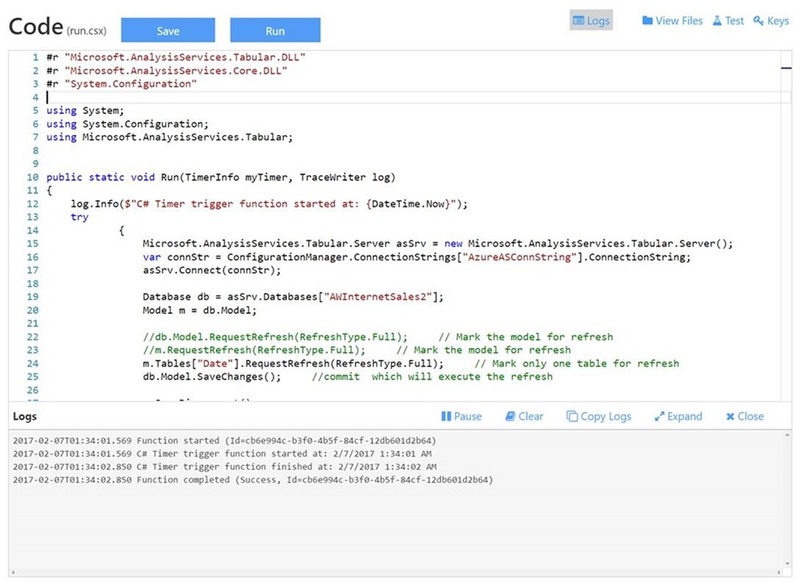 Learn more on Azure Analysis Services and Azure Functions.